Making sure your baby is content and comfortable are two keys to a happy baby. And we all know that when baby is happy, so is mommy! Babies love to be held, and you can give them that security any time of day by using a swaddle blanket! The swaddle technique imitates a womb-like security which soothes and calms infants from 0-5 months old. 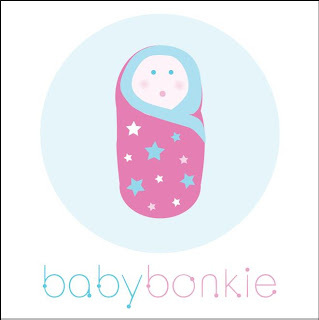 Babybonkie swaddle blankets and sleep sacks come in a variety of fabrics; swaddle your baby in a comfortable, practical, and stylish swaddle wrap. This unique swaddle blanket is designed to help infants stay wrapped up through the night allowing more uninterrupted sleep. The innovative design makes swaddling quick and easy thanks to its unique shape and velcro closures. 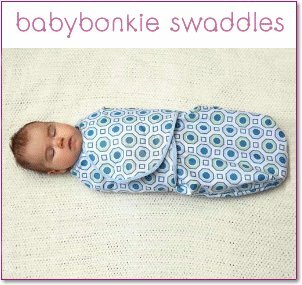 Babybonkie swaddles come in so many different colorful patterns, and they are so soft! To make life even easier for mom, all Babybonkie swaddle blankets are machine washable! The Babybonkie must fit snuggly around your baby to prevent the risk of the fabric covering his/her nose or mouth. Always be sure your baby's head is uncovered. The Velcro around the sides of the Babybonkie must be securely fastened to fit tightly around your baby's body and must not restrict your baby's breathing. This garment is not Flame Resistant. Loose fitting garments are more likely to catch fire. For your baby's safety, the Babybonkie should fit snuggly. To ensure your baby will not overheat, do not use in a room that is too warm. For your baby's safety, we suggest the room temperature be comfortable for an adult before using the Babybonkie. It is best to keep the baby's room temperature between 64-68F. You can use the Babybonkie with only a diaper. Do not swaddle your baby if he/she can roll over. Always put your baby to sleep on his/her back. Never allow this or any product to interfere with the proper use of car seats. Always follow car seat manufacturers' instructions. This giveaway will end August 8th at Midnight EST. Disclaimer: I received complimentary swaddle blanket from Babybonkie for the purpose of writing a review and hosting a giveaway. Regardless, I only recommend products or services I use personally and/or believe will be a good fit for my readers. The views and opinions expressed on this blog are purely my own. Results may vary. No monetary compensation was received. I really like the Bailey Print. I like the owen pattern. so many cute options! I like the Robin Pattern! My favorite is the Parker Print. I like the Parker pattern. The Lily pattern is my favorite. I like the Groovy Baby swaddle pattern. I like the Park Baby Swaddle.